Editor’s note: This update by defense attorney Bill Quigley has been edited for space for our print version. The Kings Bay Plowshares participants from left: Clare Grady, Patrick O’Neill, Elizabeth McAlister, Fr. Steve Kelly SJ, Martha Hennessy, Mark Colville, and Carmen Trotta. Early on the morning of April 4, 2018, seven nuclear abolitionists were arrested inside the Kings Bay Naval Base in St. Mary’s, Georgia. Kings Bay is the Atlantic homeport for six Trident nuclear ballistic missile submarines. The “Kings Bay Plowshares 7” were indicted on four felony charges: Conspiracy, Destruction of property on a naval station, Depredation of government property, and Trespass. All seven were held without bail for six weeks. As of September, Liz McAlister and Fr. Steve Kelly remain in jail at the Brunswick County Detention Facility. Liz has decided not to bail out at this time, but will wait to see if the severely restrictive bail requirements can be reduced. Steve was not given the option of bail, because he has a pending case in Washington State for a protest at the Trident submarine base. Martha Hennessy, Patrick O’Neill, and Carmen Trotta raised bail and were released May 24. Clare Grady made bail July 11, and Mark Colville was released in Sept. The five all have to wear ankle bracelets and are confined to their homes. On Aug. 2, 2018, the activists appeared before US Magistrate Stan Baker in federal court in Brunswick, Georgia to argue that all charges against them be dropped. They set out six reasons why the charges should be dismissed, and detailed arguments are available at kingsbayplowshares7.org. 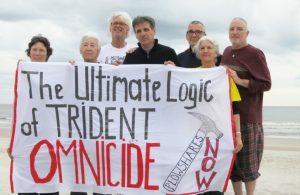 The first argument is that Trident nuclear weapons are illegal under US domestic law. The weapons on one of the several Kings Bay submarines have destructive power 2,500 times greater than the US atomic weapons dropped on Hiroshima or Nagasaki. Any use or threat of use violates US criminal law prohibiting war crimes, violates the laws of war, and violates the legal requirements of the US Naval, Air Force and Army service manuals. The Kings Bay Trident submarine’s missiles cannot possibly be targeted to destroy only military targets, so any launch will destroy tens if not hundreds of thousands of civilians within minutes—and millions more in the nuclear winter aftermath. Second, these weapons of mass destruction are illegal under US/international law. The US constitution specifically incorporates international treaty law into US law and international treaties prohibit the use of weapons which will kill civilians. The Navy’s Commander’s Handbook on the Law of Naval Operations also requires command authorities to follow international law. Third, the property protecting these illegal weapons, which was damaged in the symbolic disarmament, is not deserving of legal protection. Much like the pesticides used to murder millions under the Nazis, these weapons’ only use is illegal and immoral and the fences which protect them are likewise illegal. Fifth, because the government charged people with two counts of felony damage to property and conspiracy to damage property, some of these charges must be dismissed because they allow the government to criminalise the same conduct several ways. Sixth, the prosecution violates the Religious Freedom Restoration Act under which the government cannot interfere with religious faith or practices unless it shows compelling interest in doing so and proves that it has chosen the least restrictive way of doing it. Defendants pointed out that the government charged them to the maximum extent of the law when they could have sued them civilly or taken less punitive action. The hearing also discussed discovery requests by the defendants and the government about how much it actually cost the military to replace the lock on the fence, repair the fence and clean and repaint the places on the base where defendants wrote biblical and peace statements. The Magistrate also heard objections to the electronic monitoring shackles which each of the people not in jail are required to wear 24/7.